The ultimate tower for the Ultimate nut lover! Know a nut lover? 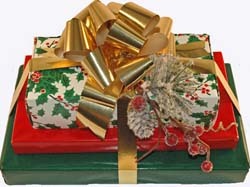 Then this traditional gift in green & red is perfect - with plenty of chocolate covered nuts! Perfecto! From Christine Stark of Gibsonia, Pennsylvania on 12/30/2014 .